The engines start revving before the first image appears in Mad Max: Fury Road. And the noise only occasionally lets up before the closing credits roll. It expands into a symphony of combustion, burning nitro, rolling tires, crunching metal, explosions, and the occasional whirring chainsaw. Accompanying this din: images of brutal choreography that, in scene after scene, set the standard by which future action films are destined to be judged. Fury Road keeps producing one astonishing image after another: sedan frames set atop tank treads, warriors on poles, bikers dropping bombs as they jump over moving cars, a mutant guitarist on a bungee cord providing a martial soundtrack of metal riffs with a flame-spitting guitar while riding atop a vehicle outfitted with a towering wall of amps and an expansive percussion section. And it uses these images to construct action scenes edited with a dancer’s sense of rhythm. Accomplished largely through practical effects—though the digital touch-ups are both easy to spot and part of the film’s aesthetic—Fury Road’s action plays more like visions from the future than like throwbacks. It’s as if director George Miller, who’s mostly spent the past few decades directing and producing family-friendly efforts like the Babe and Happy Feet films, got tired of waiting for everyone else to catch up with the action movies inside his head, and decided to show everyone how it’s done once more. If Fury Road were only interested in action, it would still be a stunning achievement, but the film has more on its mind. The fourth entry in Miller’s post-apocalyptic series, and the first since Mad Max Beyond Thunderdome in 1985, Fury Road pushes its title character further from anything resembling civilization than any of its predecessors. Now played by Tom Hardy, taking over the role from Mel Gibson, Max begins the film staring out across a desert plain, chewing on a two-headed lizard as he contemplates what’s become of the Earth after, as we learn in news snippets played over the film’s opening credits, it’s laid to waste by wars for oil and water, and all but finished off by a thermonuclear skirmish. For the first time in the series, Max seems like he might live up to his name. Haunted by those he couldn’t save, and driven, by his own reckoning, only by the urge to survive, he seems emptied out. He’s also soon running for his life, fleeing the forces of the aging warlord Immortan Joe (Hugh Keays-Byrne) and his pale, bald War Boys in the black Interceptor made famous in the first two films. Then the always-reliable Interceptor gets flipped, and Max is taken prisoner. Max’s quick capture is the film’s first unexpected turn, but hardly its last. Brought to The Citadel, Immortan Joe’s desert compound, Max is used as a human blood bag for an ailing War Boy named Nux (Nicholas Hoult). Though Max is ostensibly the protagonist, he spends much of Fury Road’s first act either hanging from a ceiling, or chained to the front of a car. Meanwhile, the film reveals the workings of The Citadel, where Immortan Joe keeps the populace under his thumb by dispensing water as he sees fit, using nursing women to produce a supply of milk, and spinning tales of reincarnation and the glories of Valhalla to keep his War Boys loyal to his cause. While Max is in chains, Fury Road shifts its attention to its other protagonist, Imperator Furiosa (Charlize Theron), the one-armed driver of a massive War Rig—a weaponized semi—trusted with making runs between The Citadel and nearby Gas Town. But on her latest outing, she decides to make an unexpected detour in an attempt to deliver some unauthorized cargo to safety: five women (Rosie Huntington-Whiteley, Riley Keough, Zoë Kravitz, Abbey Lee, Courtney Eaton) Immortan Joe has made into his personal harem and treated like breeding stock. Women have never had it easy in the wasteland. The threat of violence and sexual violation hangs over them constantly in Miller’s Mad Max films—which have always projected real-world issues into a dark near-future. 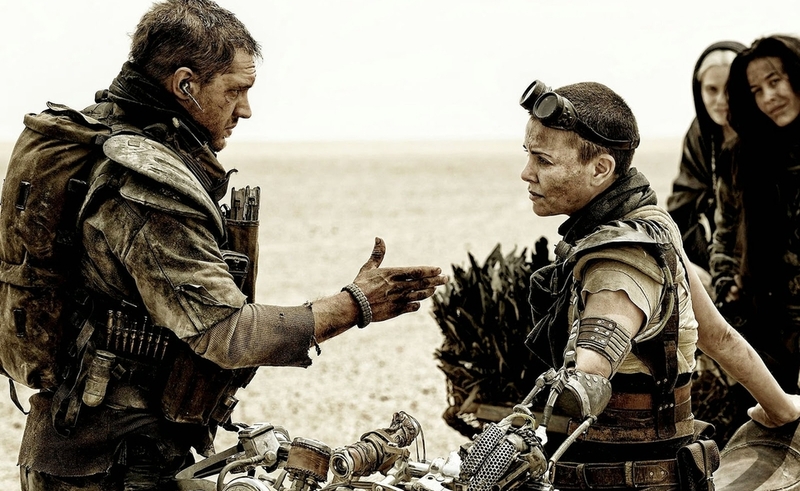 Rather than confining this element to the margins, Fury Road takes it as a primary theme, revealing Furiosa’s journey as not just flight from Immortan Joe, but a search for a safe place removed from the madness and tyranny of men. The question, “Who killed the world?” gets raised a couple of times, first as graffiti, then as a bit of dialogue, and it’s always a woman asking the question. Yet for all the abuse they’ve taken, Furiosa and the fleeing women are driven more by compassion than anger. In one of the film’s subtler touches, an unexpected early-film act of mercy has important consequences in Fury Road’s final scenes. Not that much else about the film, apart from the mostly wordless evolution of the relationship between Max and Furiosa, can be called subtle. Miller co-wrote Fury Road—whose origins date back to the late 1990s, and whose troubled production includes one false start in 2001 and a continent-shifting change of venue—with actor Nick Lathouris and comic-book artist Brendan McCarthy (Judge Dredd, Rogan Gosh). The latter provided storyboards and designs, and the film sometimes plays like an attempt to realize ideas that only make sense on the pages of comics, bringing to life cars covered in spikes and characters like “Rictus Erectus,” who more than live up to their names. It’s a world gone wrong, yet one that’s assumed a kind of horrible beauty as humanity’s impulse to survive and desire to create and innovate have become twisted toward barbaric ends. It’s also a place troubled by some of the same fundamental philosophical questions about who we are, where we’re going, and how we’re supposed to live together. But here, they’re played out at breakneck speeds, along savage stretches of unforgiving desert, in a flood of fire, a hail of bullets, and accompanied by a deafening roar.